People of all ages enjoyed yesterday's CicLAvia event. All photos Joe Linton/Streetsblog L.A. Yesterday, the final CicLAvia of the year opened Wilshire Boulevard. The roughly four-mile route extended from downtown Los Angeles to Koreatown. Tens of thousands of cyclists, runners, walkers, skaters and more enjoyed quiet car-free streets. Businesses along the route were crowded with parked bikes. Lots of families were enjoying stress-free bicycling, scootering and skating. The cool crisp late fall day was conducive to outdoor activity, in contrast to recent unhealthy air quality due to forest fires. The nearly-winter shorter days meant a 3 p.m. end time, a bit earlier than the 4 p.m. end that Angelenos have become accustomed to. Some cyclists were surprised to see LAPD and LADOT reopening the route earlier than expected. 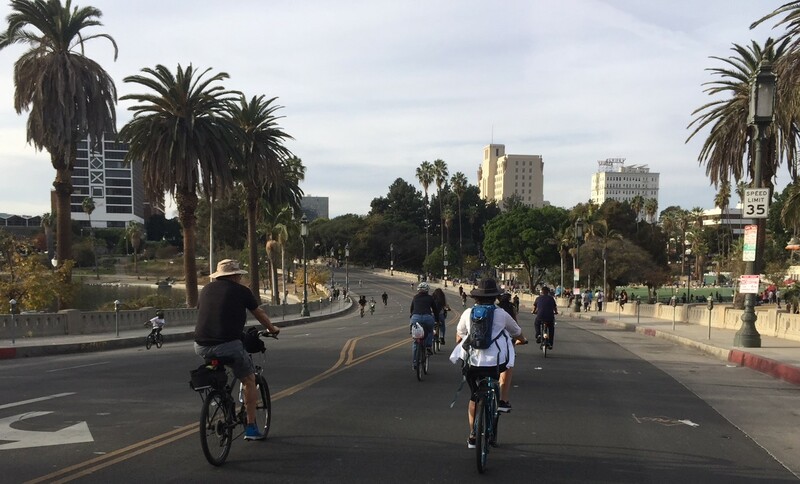 Yesterday’s CicLAvia route extended from Koreatown to downtown L.A. Yesterday was the fifth CicLAvia of 2017, though that is just official CicLAvias run by cities partnering with the non-profit CicLAvia. With Metro’s open streets program funding events throughout L.A. County, it has become difficult to keep track of the roughly a dozen open streets events this year. 2017 saw CicLAvias in Culver/Venice, Glendale/Atwater, San Pedro/Wilmington, Heart of L.A. and Wilshire, plus other great open streets events in Long Beach (University and Uptown), SGV, Downey, Whittier, and Santa Monica. Did SBLA miss any? 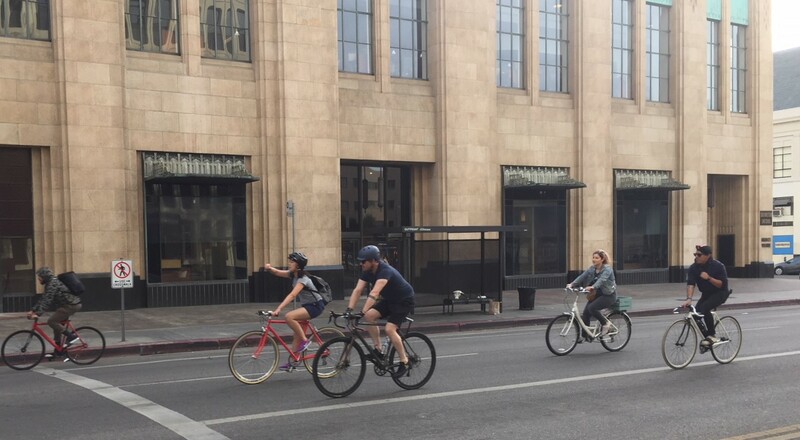 Readers, how was your CicLAvia yesterday along Wilshire? How was your 2017 in terms of open streets events? What should CicLAvia, Metro, and local municipalities focus on as they plan for future open streets festivals? Do you prefer new or old routes? Long or short routes? More or less programming? More or less frequent events? What would you like to see? 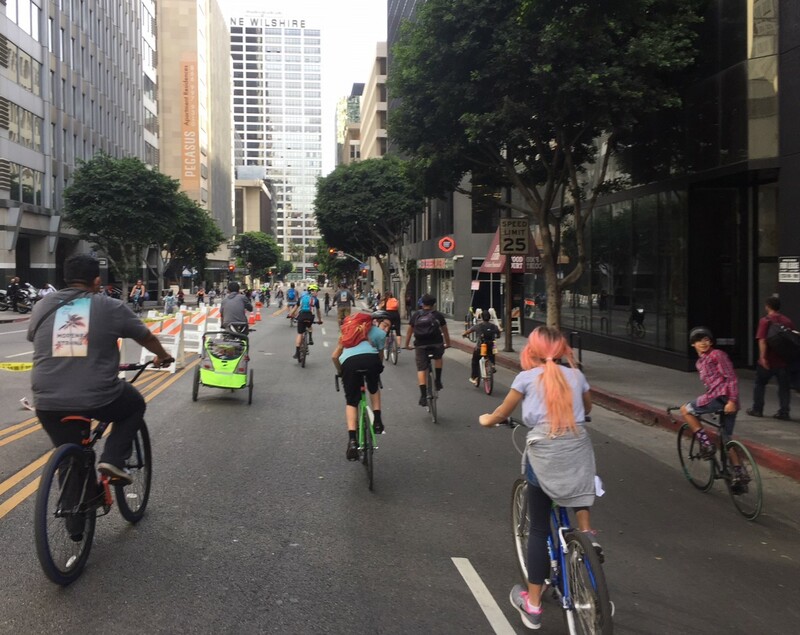 What could take L.A. County open streets to a new level? 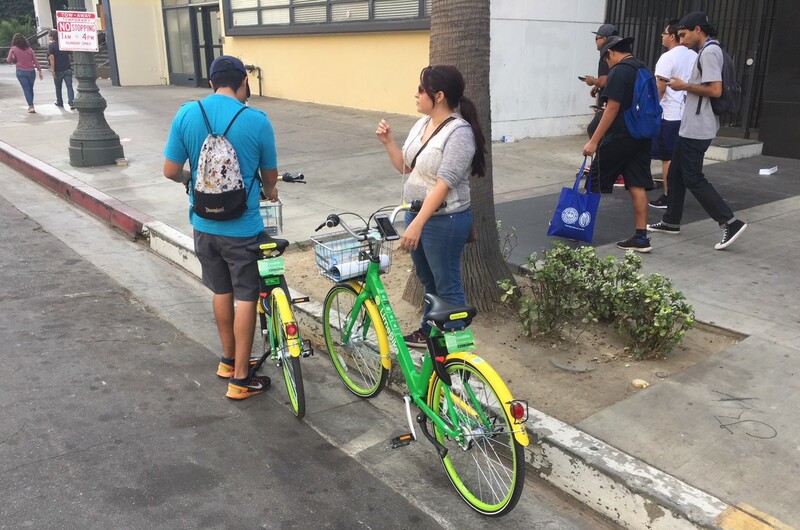 How was your experience at CicLAvia's Celebrate L.A. open streets festival yesterday?